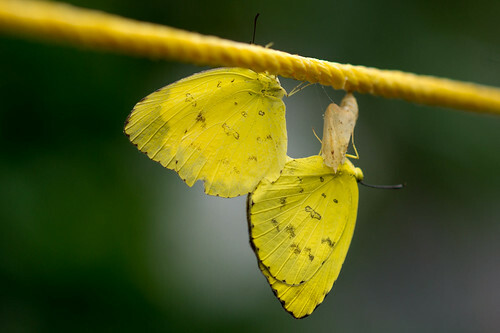 Nature Magnified: Astonishing Images of a Newborn Butterfly Mating ! 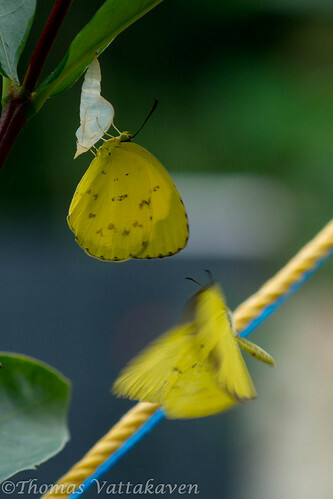 Astonishing Images of a Newborn Butterfly Mating ! 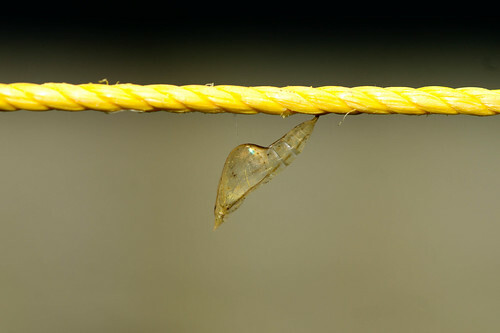 A couple of weeks back I was shooting this Common three-spot yellow pupa emerging into an adult butterfly. 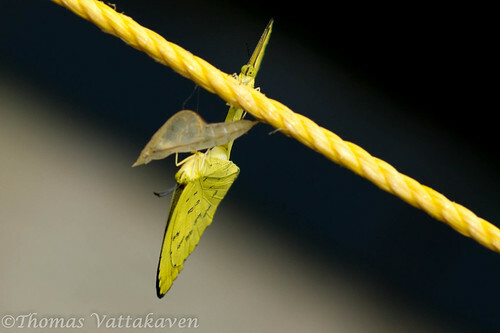 Minutes after emerging, the butterfly had just about straightened out its wings and was basking in the sunlight when suddenly it had a visitor! 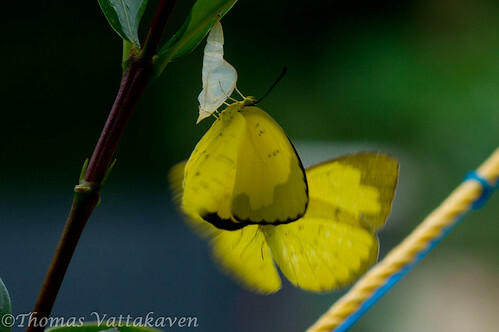 Even as I looked on, a slightly tattered male butterfly appeared on the scene and courted the new-born virgin female! 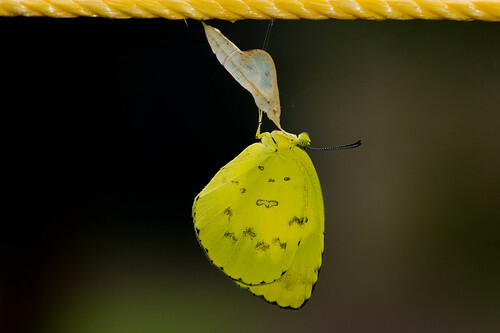 The male then proceeded to copulate with the female, which still hung on its pupal casing. It appeared to me as if the female barely had any choice in the whole matter! As if to prove my point, the male then lifted off and flew with the female still attached to its tail. 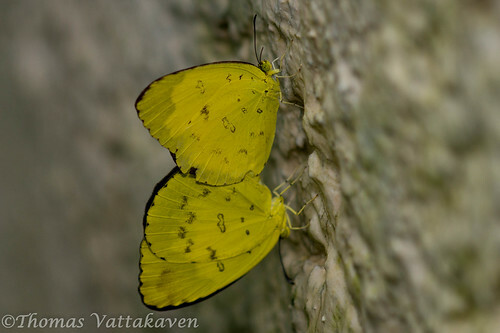 They soon alighted on a wall where they seemed to remain for a while in courtship. I was quite shocked when I first observed this act. I thought to myself that perhaps this is a one-off. Such early matings are an anomaly! Perhaps the male was confused to have selected such a young mate. It wasn't too long before I was shooting another butterfly emerging and the same thing happened again! This time I caught more of the “courtship” flight. 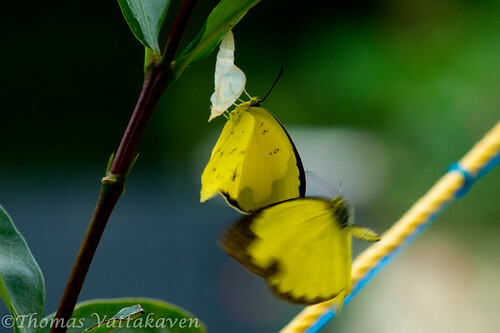 On reading more about such behaviour, I discovered that it is common occurrence in butterflies! Here`s what actually happens. 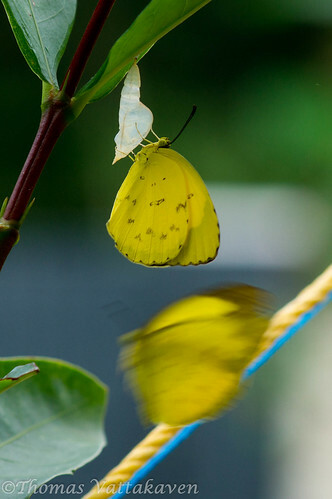 Butterflies usually live for just days. They often have less than a week in which to find a male, copulate, and lay eggs before they are dead. Hence it is better for them the earlier mating occurs. 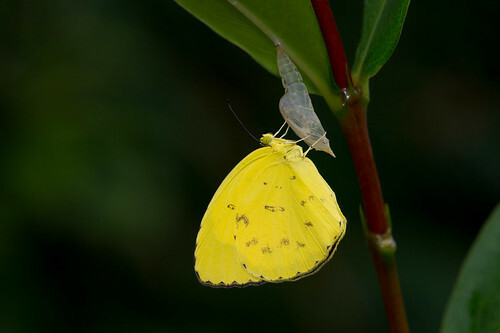 The male butterflies emerge from its pupa a couple of days before the females hatch. There are two theories why this happens. 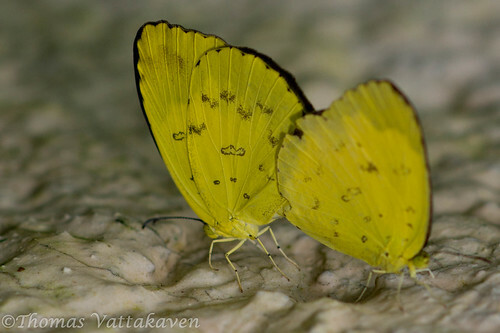 Since females can mate as soon as they emerge, it would be advantageous for the to have a number of males available to them as soon as they are born. Another theory being that, males often require 2-3 days to mature as they may need to feed to accumulate certain alkaloids from plants which are used for reproductive purposes, including in the production of pheromones. The early emergence of the male creates a demand for females and thus males are desperate to mate even as the females are being born!